I was recently involved in the preparation of an advertising campaign which included the words “Public Transport”. At the very last moment in the dispatch of over 80 newspaper ads, a member of staff spotted that the headline was actually written “Pubic Transport”. At least ten people had checked the ad before this point, including me. Yet more evidence, if evidence was needed, that the eye sees what it thinks its sees, and not what is really there. I suppose we could have argued, if the eagle-eyed helper had not spotted it in time, that Public Transport is also Pubic Transport. But I doubt our client would have been mollified, even though they had checked it too. Anyway, nervous laughter all round and no harm done. Meanwhile, one is given to musing about pubic hair. Or, hair generally. Billy Connolly once delivered a hilarious sketch wondering how pubic hair “knows how to stop growing”. Why, he asked, did it not simply keep on growing, so eventually it would come out of the bottom of your jeans, and you could back comb it to waist height and tie it in a little bow? The answer, apparently, is that some hair – armpits, pubic, arms, legs, eyebrows etc – is genetically programmed to stop growing at a certain point, and eventually fall out. This is not nearly as interesting as another answer I saw on Yahoo, which is that the pubic elves come at night and gather it, and if you wake in the morning and find an teensy-weenie little hat and boots lying forlornly on your bed, then you have rolled over in the night and squashed one of the poor little buggers going about their business. None of which, Dear Reader, really explains to me the two great mysteries of human hair. To wit, nose hair. And ear hair. As always, Wikipedia is our friend. Adult humans have hairs in the anterior nasal passage. Their function may be to keep insects and foreign particles from entering the nasal cavity. Nasal hair, of course, should not be confused with cilia of the nasal cavity, which are the microscopic cellular strands that, unlike macroscopic nasal hair, draw mucus up toward the oropharynx via their coordinated, back-and-forth beating. Meanwhile, ear hair is simply peculiar. Wikipedia for once falters and merely offers: Hair growth within the ear canal is often observed to increase in older men, together with increased growth of nose hair. Visible ear hair that protrudes from the ear canal is sometimes trimmed for cosmetic reasons. But that leaves us wondering what on earth the genetic cause of increased nasal and ear hair growth is in older men. Are older men somehow more likely to experience foreign bodies trying to get up their nose than younger men? And what earthly purpose does ear hair serve, other than instantly undoing the artifice of the mid-50s guy who tries to pretend to a younger woman in a bar that he is “just a tad over 40”? About once a month, a single, long grey hair unrolls itself from just above my right earlobe. Screams of horror from Mrs Wellthisiswhatithink lead to an immediate and savage attack with the kitchen scissors to remove said offending strand. What is it for, for heavens sake? How did growing ear hair in middle age help Homo Sapiens to win the race of life? Is it to attract small fish? Sweep the air clean of pollutants as I pass? Make me more attractive to women “d’un certain age”? If so, Charlotte Rampling is yet to ring. I think the people should be told. We rely on your ingenuity, in the Wellthisiswhatithink cohort, to tell us what ear hair is for. 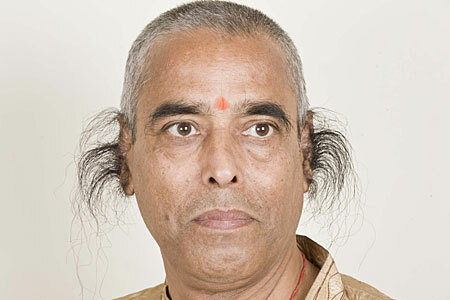 Meanwhile, I ndian grocer Radhakant Baijpai was crowned the official Guinness world record holder for the longest ear hair back in 2003, when his aural fronds were an already-impressive 13.2cm long. But that didn’t stop him pursuing his goal of ever-longer hair on his ears. After several more years of carefully cultivating and caring for the ear-hair, Radhakant’s tufts now stretch an astonishing 25cm. He is now waiting for Guinness adjudicators to confirm that he has set a new high, hairy bar for his chosen field. Radhakant, from Uttar Pradesh in northern India, acknowledges that his wife has, at times, wished that he would cut his ear hair off – but he says that she has agreed to let him keep it, as it is a source of pride. His 25-year-old son is already displaying signs of growing similar ear-hair – although only time will tell if the son can eventually take the place of the father, standing triumphant atop the pinnacle of human ear-hair achievement. Speaking personally, we will stick to the shears. Had me smiling and laughing followed by a run to the bathroom to check my ears.